Let’s face facts; its doubtful that anyone out there has seen every single card produced this year. So narrowing down and picking the sickest card of the year is a daunting task. Even getting it down to a few nominees is difficult. So we decided to go to the people who know these cards, the companies that make them. We posed the question, “What was the single sickest card you produced this year?” What we found was even having intimate knowledge of every card they’ve designed this year, our question was not an easy one to answer. But after much internal discussion, they did come to a consensus. Panini had a lot of ways to go with their selection this year. The depth of their insert cards is impressive. This card may not be as loud as some of their others but it is sick and an excellent, meaningful choice. This card is the first ever memorabilia card for Ernie Davis. 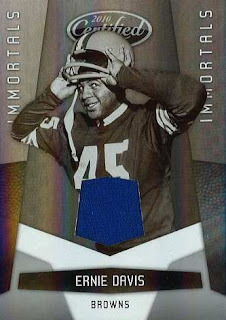 Davis was the first African American to win the Heisman Trophy, the number one NFL draft pick of 1962, died of leukemia at the age of 23 before he played a single down of football in the NFL, and was profiled in the movie “The Express .” The piece of material used for this card is from Davis’ 1962 College All-Star Game that Panini bought at auction for $23,900. There is a behind the scenes video story of the jersey and the how this card came to be at Panini’s Blog, The Knight’s Lance. Press Pass is the only card company covering racing. You would think with that kind of monopoly and control they could phone it in. But they don’t. Their releases look fantastic. With the tons of logos and wide variety of materials that racing has to offer, from firesuits to tires to sheet metal, they are able to come up with some really sick looking cards. This is from their recent Five Star release and the booklet speaks for itself. Not only two of the greatest drivers of all time, a father/son combo. With the great autographs and fully embroidered patches that are as good as any we’ve seen in any sport, even if you are not one of the 38% of people in the US that identify themselves as racing fans, you can tell this is one sick card. SA-GE is a small company putting out a big product. With collectors trending heavily towards rookie speculation, this company is producing an exclusive run of cards to satisfy that craving. But as with any boutique company making a carefully watched over product, its gonna cost you big time. Not so with these cards. This hand numbered, triple auto came from a box of 2010 SAGE Autographed Football. For about $100 you get 12 packs with one auto per pack, and you’ll never see a redemption card. That many pulls at that price point is sick and this is their sickest. It’s Topps so it had to be a Strasburg, but which one. Even more than the Superfractor, this Red Auto 1/1 caused a huge buzz in the collecting community this year. With bids on eBay reaching near one million dollars and then quickly going away, this card was moved to Huggins & Scott Auction House and finally sold for $19,975. 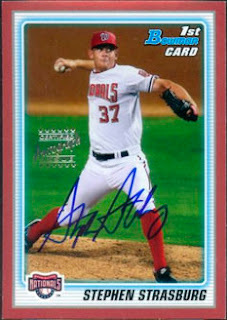 In the process, it pushed the value of all the Bowman Strasburg autos sky high. Being able to get that kind of return on your collecting investment makes this one truly sick card. Originally when I posed the “your sickest” question to Upper Deck, their pick was this card. 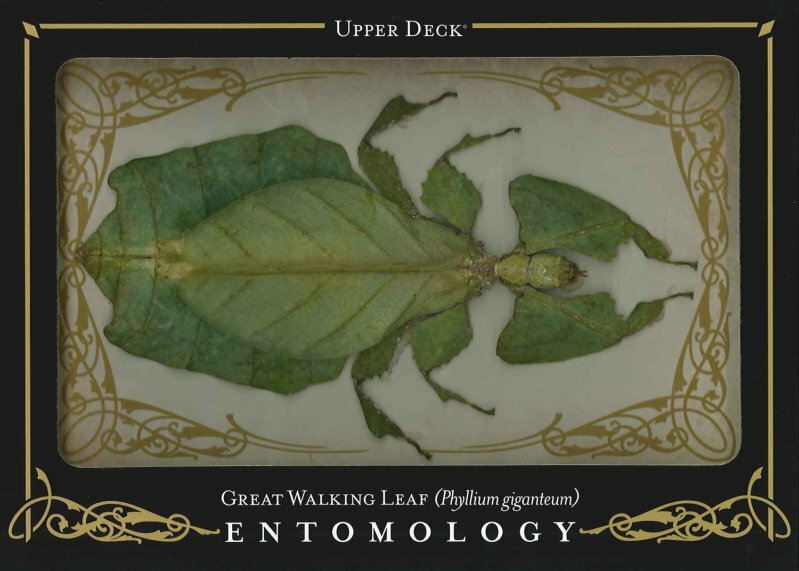 It's a Great Walking Leaf Entomology Card from their redemption program included in the 2009 MLB Goodwin Champions release. This card is working the sick angle on a whole bunch of levels. That is an actual bug... in a card... and the card is 5 inches by 7 inches... and its about the thickness of a summer paperback novel. 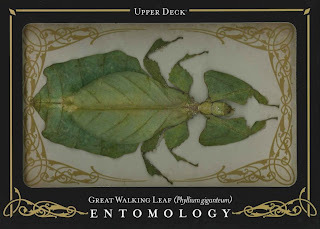 You can see a great video on all the cards from the Entomology series using this link. If you want to see what these are reselling for now, follow this link. The first thought was “it’s a bug, what does that have to do with sports?” But if Allen & Ginter can have Chihuahua inserts, why not a bug? The problem is the release date for the set was September 2009. Even though the redemptions took until 2010 to fill, we can’t count it for these awards. But it certainly gets an honorable mention. Then Upper Deck came back with the 2009/10 Gretzky Shadowbox Auto. Pictured above is the insert card without the auto. No picture of the complete auto card was available. 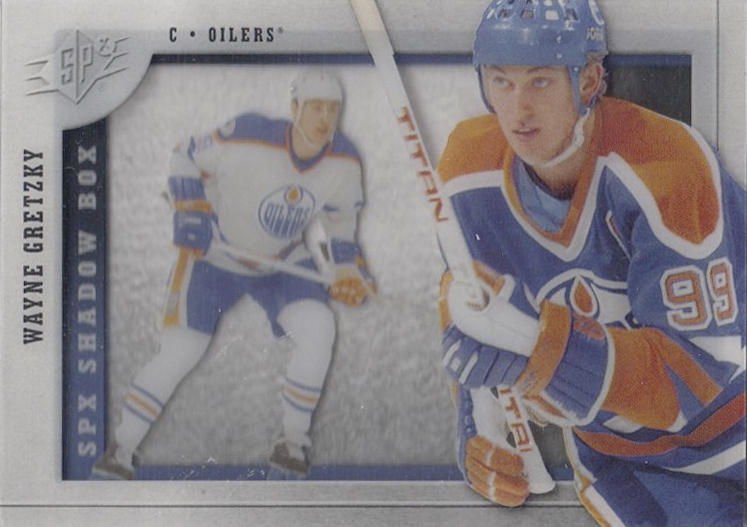 This highly innovative set of inserts from the SPx Hockey line was very popular with collectors. The insert without the auto goes for close to $100 on eBay and with Upper Deck's exclusive on “The Great One,” pulling this card had to have been sick. So that will do it for this year’s nominees. Attempts were made to get nominations from other companies. No one was excluded from the process. Voting will begin on this category along with Fan Favorite Set of the Year and Box Most Likely to Contain Mojo in the next day or two, so you have some time to think about your picks. You’ll also have the opportunity to enter to win a prize pool of several boxes of cards, all of which will be explained when voting begins.